Care UK is a leading provider of health and social care services. It runs GP centres, hospitals and care homes, and provides support for people within the community. 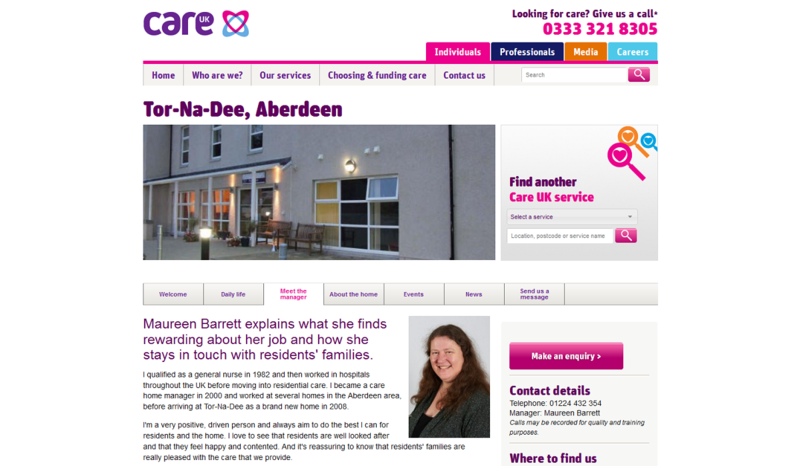 The company needed in-depth profiles for its 92 residential care facilities to appear on its website. Fellow copywriter Jo Tidball contacted me to work with her on this very large project. Carried out individual telephone interviews with the managers of 55 care homes across the UK. Based on the interviews and marketing materials, wrote a profile for every facility following corporate tone of voice and writing style guides. Each profile draft comprised four pages (each with its own metadata): introduction, daily life, manager profile and facilities. Contact me to find out more about this Care UK project or to talk about working together.